Something overlooked at Halloween time is proper fire safety. Halloween is less than a week away. In fact, it’s only a few days away. You’ve heard plenty of urban legends about safety on this night, whether it’s for you or your family. But one factor that might often be overlooked is fire safety. Using fire adds another dimension to your decorations, but as always, you want to be sure it doesn’t get out of control. 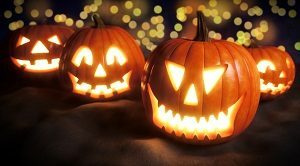 Putting candles inside your pumpkins might be the traditional way to light up a jack-o-lantern, but it’s also dangerous. Any time a flame is exposed, you should watch it carefully. You may have heard the saying that a watched pot never boils – but anything unattended is liable to burn. That makes a pumpkin major fire safety risk. Instead of candles, consider using LED lights or glow sticks. Pumpkins aren’t the only decorative touch that can go up in flames. Our next fire safety calls for you to make sure you don’t put your other decorations too close to the fire. Scarecrows, cornstalks, and bundles of hay are all common decorations due to Halloween overlapping with harvest season. Still, either keep these away from open flames or use electric lights instead. There’s no doubt that costumes are the main attraction come Halloween time. But believe it or not, costumes can be a danger too. So, keep fire safety in mind when choosing an outfit either for yourself or your kids. Costumes and their accessories should all be fire-proof or at least fire-resistant, which is an attribute you might see listed as flame-retardant. As fun as Halloween is, some inconsiderate pranksters think setting fires is hugely entertaining. Even though you do all you can to stay clear of an accident involving fire, what do you do when someone starts a fire on purpose? Incidents of arson often multiply on or around Halloween, so if you see anything, say something to the authorities. Whenever a fire happens, it’s best to know how to escape it. Any escape routes near your house or in your neighborhood work. Don’t overcrowd your yard in case anyone needs to run away quickly enough. This entry was posted on Friday, October 27th, 2017 at 3:45 pm. Both comments and pings are currently closed.